Breeze Bike Share is operated by a separate company, CycleHop, rather than directly by SoBi as is the Sacramento system. The company also operates systems in West Hollywood/Beverly Hills, Long Beach, San Mateo, and other cities outside California. 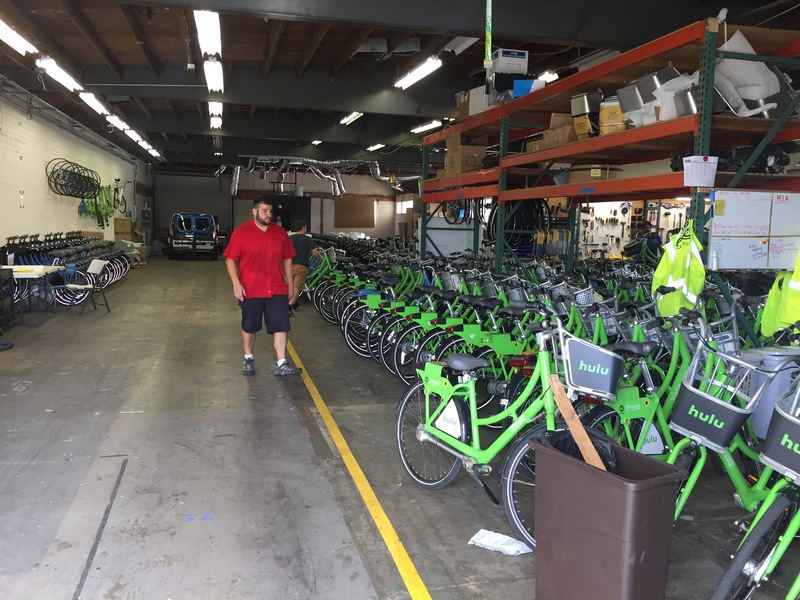 CycleHop has a major maintenance and storage facility, which I stumbled across, shown in the photo above. They tried rebalancing with bikes for a while but have gone to using vans as they are more efficient. Breeze bikes are green, and the major corporate sponsor is Hulu. As far as I know, Sacramento is still in search of a major corporate sponsor. The cost per hour for Breeze is $7, whereas Tower Bridge is $4. This makes a difference! Though I only used up $5 of my initial investment (it costs a minimum of $7 to join), this is only because I spent time every day returning bikes to,hubs in order to gain return credits. Return to hub credit is $1 in the Breeze system, $1.50 in Tower Bridge. It makes a difference! Outside-hub fees are $2, and outside boundary (geofenced) is $20, the same as Tower Bridge. I saw people riding Breeze bikes all over town, at all times of day. I often saw the hub racks fill up and empty out over a short period of time, so I know that bikes in the busiest areas were getting many trips per day, though I don’t have any data. It is rare to see Tower Bridge bikes on the road, and though I think they get used one or two times a day, use per bike is much lower. 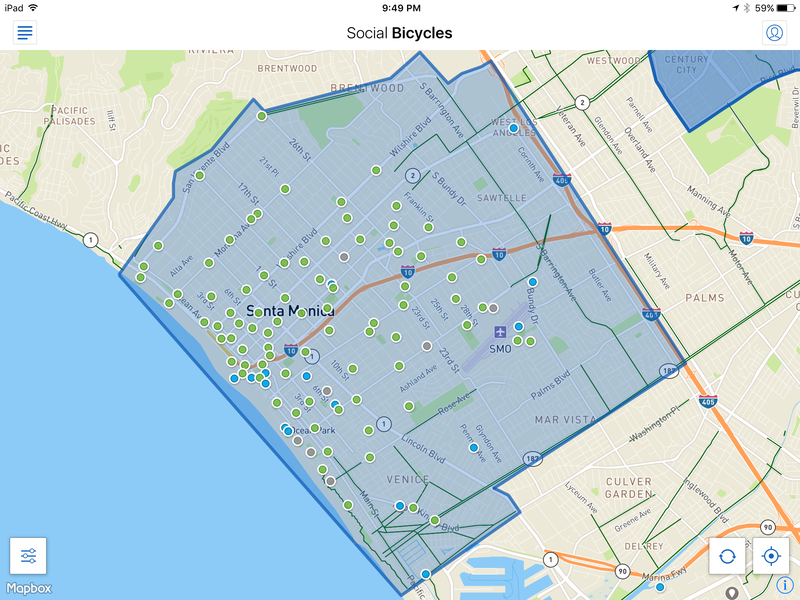 Downtown Santa Monica has a high density of hubs, about every two blocks, but the hubs are much sparser in the more suburban parts of town. The downtown hubs are quite large, up to 16 racks spaces. The advertisement says 500 bikes, 80 stations. Several of the hubs are sponsored, which is indicated by a different icon for the hub, but I was unable to find out more about these sponsored stations, and it was not obvious who was sponsoring them. Tower Bridge does not have any sponsored stations at this time. Hubs were located close to each light rail station (Metro Expo Line), and at many major bus stops. Tower Bridge hubs are not. Breeze has the same problems of geo-location that Tower Bridge has, sometimes bikes shown as in hub were not, sometimes bikes shown as out-of-hub were at a hub, and sometimes the bikes were nowhere to be found at the indicated location. More of an irritant than a major issue, since the next hub or bike is not far away. Breeze has a low-income program, but details are only available on request, not on the website. Breeze allows users to unlock bikes with a registered TAP card (similar to Connect Card), but charges are to the Breeze account and not the TAP account. I’m using my Connect Card in Sacramento, and also used it in Santa Monica. Using a card is a slight convenience over entering a six digit number. Santa Monica has flat areas, and gently inclined areas, similar to Sacramento and West Sacramento, but the rise from beach level to downtown level, and out of the Rustic Creek canyon, is comparable to American River up to Fair Oaks. A lot of bikes get left down by the pier and beach , so I imagine part of the re-balancing effort is getting these bikes back up the hill. Breeze map below. Green dots are hubs with bikes, grey dots are hubs without bikes, blue dots are bikes parked out-of-hub. You can see the higher density downtown.